Utah is gearing up for its 24th of July festivities. July 24th is the day when the first Mormon pioneers entered the Salt Lake Valley and celebrating it is a really big deal in Utah. Salt Lake will have their big "Days of '47" festivities on Tuesday but Bountiful, which is the city just to the north of SLC, had their celebration on Friday. The best part was the Handcart Days parade because the very last entry was incredible. One of the men that Jon works with has been trying for 12 years to convince the parade committee to let him have 2060 young men dress up like the stripling warriors (aka. Sons of Helaman) from the Book of Mormon. This year they finally said yes and so after much work 2060 young men from the Bountiful Stakes dressed in matching costumes (that their moms made :) and carried staffs with nails in the bottoms so that they would make a strong sound when they were pounded on the pavement. 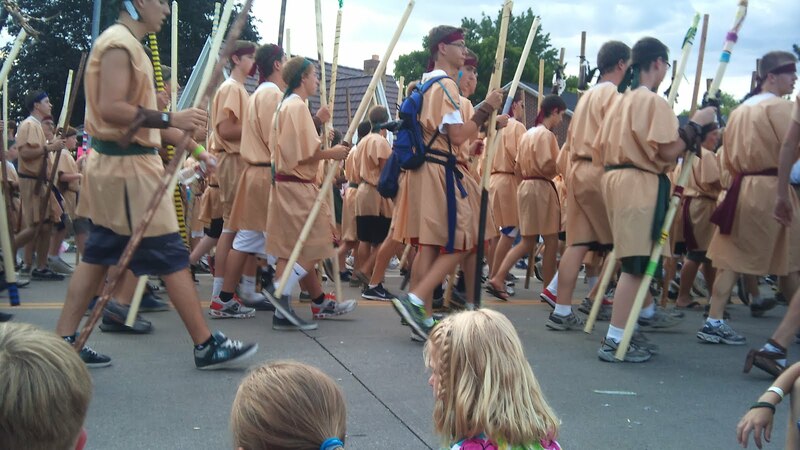 They were led by a man (Jon's co-worker's brother) who was dressed as Captain Moroni and the sight was incredible. We had been hearing about this for a few months, and some of the boys in our ward were marching, and so I was really looking forward to it. But when I looked down the street and saw them coming in a mass my heart nearly skipped a beat. They looked amazing and I felt a wave of the spirit as they went past. They were marching in lines (mostly) and pounded their staffs on the pavement in unison. There were boys in the middle of the lines holding high staffs with ribbons on them so that everyone could see when they needed to pound their staff and some carried banners and titles of liberty. They stopped several times and Helaman lead them in a chant of "We Did Not Doubt" (which you can see in the video). I could tell that lots of the boys were really feeling the power and the spirit of what they were portraying. It was really powerful. The shear number of young men was overwhelming. I think you can get a bit of a feel for it in the video, but seeing it in real life was awesome. They stretched for about 6 or 7 city blocks and it took them about 3 minutes to all pass by. I knew 2060 was a big number but I never realized just how many young men that was. It just made the miracle of their story-- the fact that NOT A SINGLE ONE of them died in battle-- more amazing to me than ever before. I apologize that my videos are broken up into segments, Rose dropped her water bottle in the storm gutter and when I went to try to get it my camera turned off. But I think it gives you an idea. I didn't get my camera on to get the beginning but if you go to this video you can see Captain Helaman leading them. Amazing and I love your idea of Moms walking behind them, or maybe even in front of them next year!!! Even 1000 moms, as most probably sent more than 1 boy. What a great experience for all involved. I have been thinking about those boys a lot recently, and the mothers, too. I hope that the young men who took part were able to gain a stronger testimony of the importance of trusting God, and listening to their mommas! I'm so glad you posted a video of it. I had heard about the 2,000 stripling warriors being in the parade and wanted to be there but could not make it. Thank you for allowing me to "see" it. I watched this on fb yesterday and thought it was very cool! Reading this post was awesome. Thank you! Thanks for sharing this--what an effort to put that together, but what an impact! That's so awesome! My cousin was one of them!